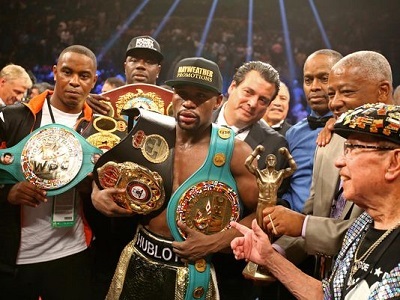 Undeafeated boxing champion, Floyd Mayweather has been stripped of the WBO welterweight title he won by beating Manny Pacquiao two months ago because he reportedly failed to meet the deadline last Friday for paying the $200,000 sanctioning fee required by the WBO. The five-division world champion took the belt from Pacquiao in Las Vegas on May 2 in the richest fight in history, earning a reported $220 million. WBO rules require boxers to pay 3% of their purse to fight for a world title up to a maximum of $200,000. The rules also prohibit WBO champions to hold any belts in any other weight divisions. 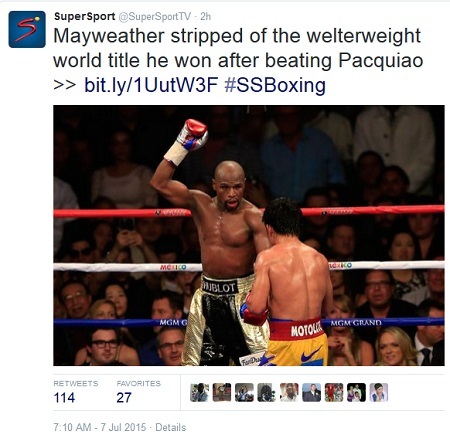 Mayweather is also the WBC and WBA champion at super-welterweight (69.85 kg) and welterweight (66.68 kg). 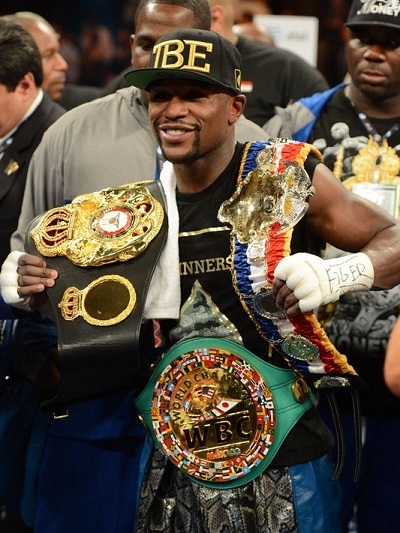 A statement on the Puerto Rico-based sanctioning body’s website confirmed that Mayweather, regarded as the best boxer, pound for pound, in the world, was no longer the WBO champion. “Despite affording Mr Mayweather the courtesy of an extension to advise us of his position within the WBO welterweight division and to vacate the two [69.85kg] world titles he holds, the WBO … received no response from him or his legal representatives on this matter. American Timothy Bradley, who defeated countryman Jessie Vargas for the WBO interim welterweight belt on June 27, is expected to be formally elevated to full champion status by the WBO.